I made a few more chicks today and their mother hen for DQS8. At first I didn't like the hen (these are colors I hope my quilt swap recipient will like but they wouldn't be my first choice for me, you know?) But after I added the polka-dot comb I decided I like her. Paper piecing can get confusing, I didn't get the right number of chicks facing the way I wanted so I might make a couple more; I want most of them to be following behind her. I turned one of the chicks over so you can get a better idea what they will look like finished. I am still planning on making some eggs but I'm not sure about how the quilt will be arranged yet. 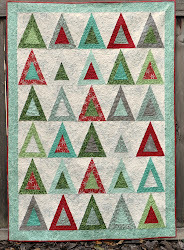 Maybe with a vertical row of eggs and some Collaborative Quilting -style wonky stars or shoo-fly blocks too. adorable!!! I want to make one now!!!!! I'm not a traditional gal, but I can definitely see a fun take on that square. Love it! Your mother hen and chicks are darling! I love the idea of having them follow! So cute!! I love your Noah quilt too! Almost as cute as Clucky Renee! Remember her? Love your hen and chicks! Adorable! What a cute hen. The colors are great! I love the little chicks too. Are the pattern available somewhere? 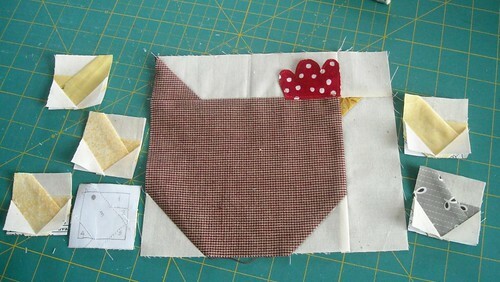 I've love to have them -- I'm getting ready to make a chicken quilt. Thanks! are the chicks and hen also from A Quilters Ark book? if not where would I find them? more cute chicks and a mama chick! so cute! !